I have a 670g system that I needed to do a cycle fast on. I bought several bottles of the ammonia and one 32oz. Bottle of the bacteria. I used 3/4 of the bacteria and only 2 treatments of the ammonia to get my tank going. 3 days later I added 6 very large fish, all my old inverts, and corals. One more week later I added 4 more large fish, 3 anemones, and 4 shrimp. Tank is still keeping my levels at zero for ammonia and nitrite. Nitrate is barely recordable. Great product, will use again. Hi, i bought the 8 oz. bottle for my 125 gal. tank. I used tap water and prime, dropped in two clown fish on 7-4-2015. Som far things are GREAT!!! This product did just what they said it would do, I have 140 pounds of " LIFE ROCK " in my tank , by the way. I thought it was a little pricy , but because it has worked so well, it would be cheap at any price. I had a question, they wrote me back that same dame day, GREAT people, they really CARE!! We love One & Only! Our incoming fish systems (8 of them) are sterilized after every shipment to mitigate heterotrophic bacteria breaking down medications during future QT runs. After sterilizing we need them back up to accept another shipment post haste, which is where One & Only comes into play. 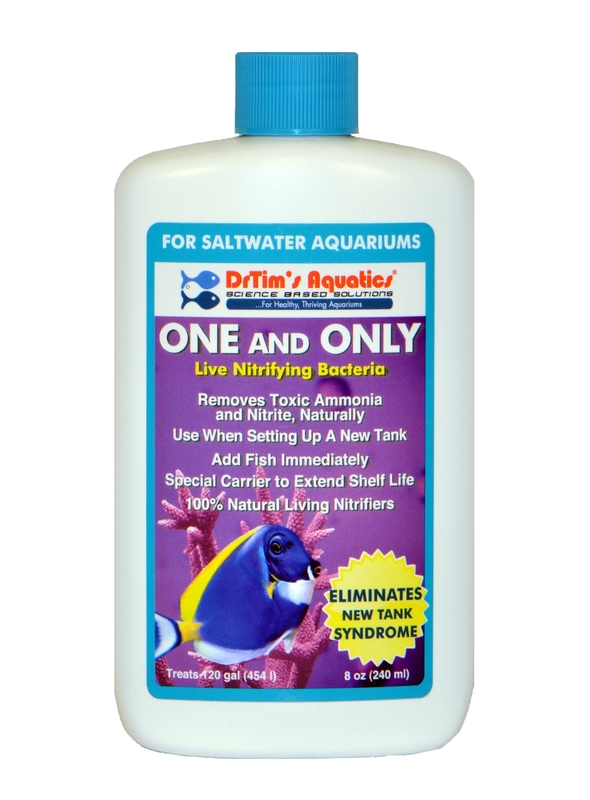 Using O&O along with the ammonia available i was able to cycle my marine aquarium in about 3 weeks. I will more than likely use this product again if/when i need to cycle a new tank. Good quality product. Works as advertized. great stuff it works and in days your tank is ready to be enjoyed!!!! will buy again and definitely recommend this product. Product does what it says it does. Easily the best way to cycle your tank. cycled my 140 gallon in 3 days! worked great! highly recommened! why wait 30-45 days when you can have your tank running in a week!? My cycle was about 3 weeks. All parameters are good but lost 3 small Chromis that I bought to start cycle. Clown is good and so is cuc. Tank is 120gal with BRS dry rock that was put in to Lanthium chloride solutions for a week prior to get PO4 out. Also running GFO and Carbon. Don't know why Chromis died as ammonia and nitrite levels got over 1ppm. this stuff worked really good for me in my 80 gallon reef. cycled my tank is less than a week and by the end of that week i added a purple tang and hes happier than ever! This product is awesome and really works. I started my cycling process with this product and in only two days my aquarium was fully cycle. I added two clown fish to the aquarium and observe no sign of stress at all. I highly recommend this product. This product is awesome...we went from a new tank, to a tank full of fish & corals/inverts, in 7 days. It helped our project out so much, shortening the maturation process to such an extent. I can't recommend this product enough.